One of my aims with this blog is to tell you a little more about members of staff in the department – about their research interests and their various activities and publications. This week, I’m going to stay close to home, and say something about the colleague who has the office next door to mine – Suzannah Biernoff. Suzannah joined us in the department in 2007, and she works broadly in the field of visual culture, histories of the body and emotion. She’s a rare scholar in having published on vastly divergent periods – both medieval and contemporary visual culture! Some of her most recent work has explored powerful, often distressing issues around facial disfigurement and representation in the First World War. Suzannah is currently working with Fiona Johnstone on an important project funded by the Wellcome Trust, called Visualising Illness. This is bringing researchers together with artists and clinicians, and they have organised an exciting event for 14th November. Professor Joanna Bourke will give a lecture on ‘Pain and the Art of Amputation’, followed by a panel discussion. You can find out more – as well as explore the project’s mesmerising picture gallery (from which I have stolen the below) – on their webpages. Fiona recently submitted her PhD on ‘Challenging Portraiture: AIDS, self-representation and the death of the artist’, supervised by Suzannah, but she has managed to find time, alongside her doctoral work and many other activities, to be a key member of the Student Members Committee of the Association of Art Historians. 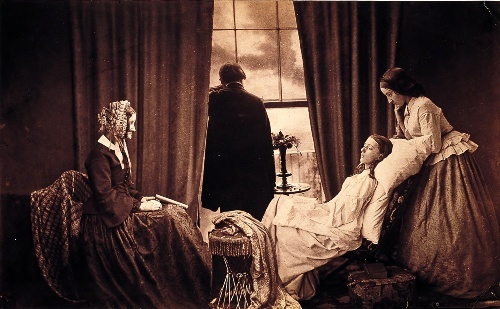 She has co-organised this year’s AAH New Voices conference, ‘A Picture of Health’, along with another of our PhD students, Nicola McCartney, sponsored by Birkbeck and the Wellcome. ‘New Voices’ will take place on Friday 7th November, and will include an evening wine reception with a keynote address from the artist Christine Borland. Fiona also kindly came along to the BA History of Art Induction evening a few weeks ago to give a talk about this important organisation, which brings together all art historians, whether studying the subject or working in schools, universities or museums/ galleries. It’s well worth considering joining the AAH, to get access to a wealth of news and information, events and publications. I also highly recommend the ‘Careers in Art History’ book they’ve produced – you can either buy it hard copy, or pay to download it from their website, and it’s packed with useful advice. As part of her presentation to the new first year undergraduates, Fiona spoke about a number of funding opportunities open to members of the AAH – which are so attractive, I wanted to share a couple of them more broadly with you all. * The AAH Internship Award offers funding to UK-based undergraduate and postgraduate students on part-time or full-time placements or internships within the UK. There are two awards of up to £2,000 towards placement-related expenses such as accommodation, travel and food. * The AAH also runs the John Fleming Travel Award, offered annually by Laurence King Publishing, in memory of the art historian John Fleming. The aim of this award, £2,000, is to enable students to travel as a means of assisting or furthering their research. The award looks to encourage a better understanding of the arts from around the world. * Leslie Topp, Zoe Opacic and Tag Gronberg organise a network on Architecture, Space and Society – and they have a wonderful site I’d highly recommend looking at: http://assnbbk.blogspot.co.uk/. Their next event is coming up on Thursday 23rd October, 2-5pm – a symposium called ‘Skylines: The Aesthetics of Ascension’, which will explore the aesthetics and politics of height, skylines, and views from above, across periods and geographies. * not one but two members of the department are involved in a symposium on Tuesday 4th November at Tate Britain: ‘”A Poor Man’s Picture Gallery”: Art and Stereoscopic Photography’. This accompanies an exhibition of nineteenth-century stereoscopes from the collection of Brian May (The Brian May, formerly of Queen!). Patrizia di Bello will be giving a paper, and Lynn Nead will be chairing the plenary discussion. The following account of our building is heavily indebted to the work of others – Patrizia, our resident expert on the Bloomsburys – Leslie, who had us on the tourist trail in the Open House weekend last year – and Victoria McNeile, who did her PhD in English here at Birkbeck, and put together a valuable fact sheet for that weekend. Gordon Square was developed as part of the Bedford Estate in the early nineteenth century, and was the work of one Thomas Cubitt. Our section of the eastern terrace was completed by 1830, and it’s now Grade II listed. It’s hard to imagine today, but, in the nineteenth century, Bloomsbury was not a fashionable address. However, by the turn of the twentieth century, artists and bohemians were moving into the area and, as a result, it attracted the Stephen siblings – Vanessa, Virginia, Thoby and Adrian – in 1904. 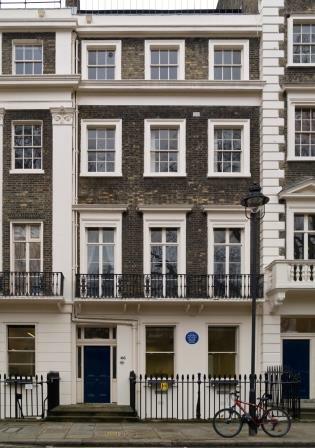 For Virginia (so much better known by her married name, Virginia Woolf), it represented an exchange of the ‘respectable mummified humbug’ of Kensington, the Stephens’ previous family home, for ‘life crude and impertinent perhaps, but living’ then to be found in Bloomsbury. The family moved into number 46. At that time, there was kitchen/servant accommodation in the basement, a dining room and two studies on the ground floor, a large L-shaped drawing room on the first floor, and bedrooms and individual sitting rooms at the top of the house. The first of the Bloomsbury Group’s Thursday ‘evenings’ took place in 1905: gatherings which included Clive Bell, who Vanessa married in 1907, and Leonard Woolf, who became Virginia’s husband in 1912. Other members included Lytton Strachey (he lived nearby, at no. 51), Duncan Grant, Roger Fry and John Maynard Keynes, the celebrated economist and intellectual. 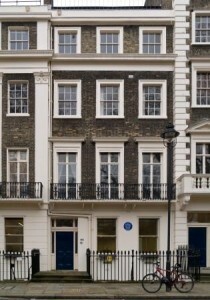 Keynes later moved into number 46, with his wife, the Russian ballerina Lydia Lopokova. He leased the house next door, 47, for his books – hence the ‘Keynes Library’ on the first floor of that building, which students who have been with us for a while will know well, and where new students will very possibly have enjoyed a glass of wine on their induction evening! 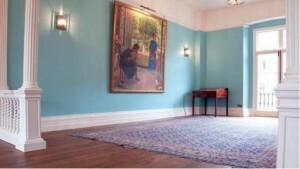 The paintings which, hopefully, as good art historians, you have all diligently scrutinised, are by Vanessa Bell and Duncan Grant, and are on loan to Birkbeck from Bell’s daughter, Angelica Garnett. In a later blog, I’ll tell you about our striking, modern and award winning extension on the basement level of the School of Arts building, undertaken by Surface Architects in 2007. Quite a contrast! I’m Dr Kate Retford, the current Head of History of Art at Birkbeck College, and this is my new blogsite. I’ve set it up principally for students within the department, whether working towards a Certificate, BA, MA or an MPhil/PhD degree. Over the course of this academic year, I will be posting up news, events and features about life in the department, keeping you up to date with all the latest activities of staff and students. The History of Art department, and the School of Arts more broadly, is a dynamic environment: members of staff give papers, publish articles and books, and work with galleries, museum and the media. 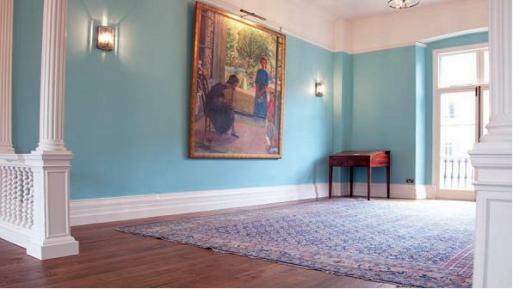 There are many talks, seminars and conferences to go to, and exhibitions hosted in the Peltz gallery at Gordon Square to view. We also have the highlight of the School of Arts year – Arts Week, held every May, when we showcase the wide range of our activities. There are various places where you can find out about all this activity, and I do encourage you to follow tweets from the History of Art department: @BirkbeckHoA, and the School of Arts: @birkbeck_arts. Here, I will bring together some of the highlights, but I’m also hoping to give you more news about our students and programmes, and to include features, such as profiles of individuals within the department. If you’ve been involved in something you think may be of interest to your fellow students, or if you would simply like to write a piece explaining how you came to be studying History of Art at Birkbeck, please do get in touch with me, as there will be guest slots available! In this first posting, I also want to repeat the welcome I’ve been giving at various induction evenings over the last couple of weeks, to all the new students who’ve just joined the department on our various programmes. This is always an exciting time of year, when new faces join more familiar ones. I hope you all settle in well over the next few weeks, and enjoy your first classes – or, in the case of research students, your first meetings with your supervisors. It is an exciting time – but it is also a challenging one, as you settle into study – perhaps after a period away from education – probably moving up a level from qualifications taken before. You will find that the History of Art department is a friendly and supportive environment, and I do urge you to keep in contact with your course directors, your supervisors, your Personal Tutors, and let us know of any difficulties you experience. We are very much here to help.